I have been away from my blog for far (understatement) too long and I feel like there's no amount of explanation that would appease any of you, my dear readers. I am just too thankful that you have stuck with me through the silence and the temporary gap (yes just a gap). I will recover and get my blogging mojo back again. I had so much fun during this shoot. Oh and yeah, I thought I posted the article that Summit wrote about my #24HRFiesta experience in the November issue of FHM (Danita Paner on the cover). Huge thanks to my college friends who bought the magazine and graciously took a picture of it. Haha! I was tickled pink when they tagged me in the picture. October was when I moved to another company. Ah well, I did not quit my job, I just moved to a new company. To cut the long story short, our department was bought by another company and the rest they say is history. We're still on the adjustment phase (until now) with all the changes that had to take place and I guess we're on cruising speed now but all the stuff we had to deal with took a toll on me. I'm a little bit overwhelmed, to say the least. But I am glad to say that I am managing. I was also able to squeeze a little vacation time and I went to Sarangani Province where we had our family reunion. Then November rolled in... It's sweet November for me mainly because the hubby is home after almost 6 months of being offshore. 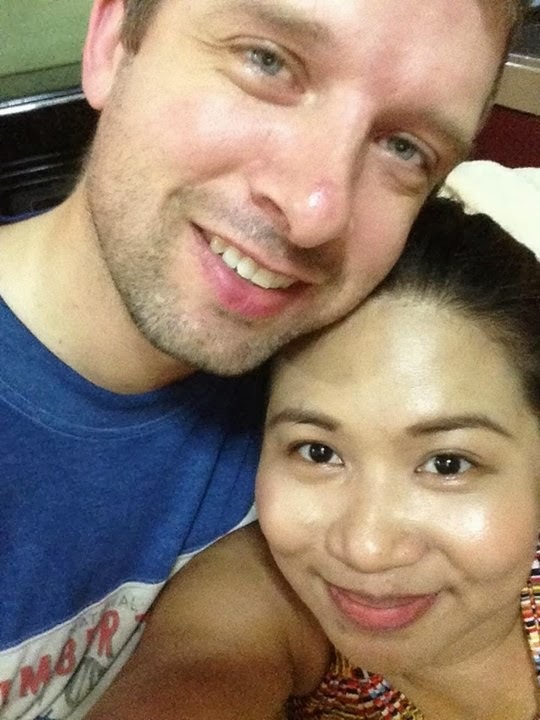 He had been to Dominican Republic, Curacao, Bermuda, Russia, Denmark, and Texas and after missing a lot of important dates especially our first wedding anniversary he arrived on our 13th month together. Life is good! Me: "Baby, the next time you come home and see me at the airport, you might want to drop your bags and run towards me. That would be extra romantic - kinda like the movies." Christian: "Ah, and I risk losing all my stuff as well as your gift. Not happening in Manila..."
Me: "Okay, then bring your bags and just run towards me and give me a kiss. Are you shy about all those people around us?" Christian: "My love, I wasn't shy at all (not one bit). I was actually shy that you would ask if I brushed or not. There was a long line at the lavatory and I wasn't able to brush before I got out of the plane. But yes, next time I will do it." So yes, I am busy yet extremely enjoying my time as a wife. We're planning to spend Christmas and New Year's in Denmark so I hope my Schengen visa gets approved. I think it will be approved though. The only reason why I think I would get denied (Oh God forbid) is the timetable of my application. I had to change all my ID's to my married last name that's why and I had to get a new passport too plus of course that dreaded counseling which I had to line up from 4 in the morning. Sigh!